We are excited to announce the addition of seven colorful and patterned images by Bainbridge Island-based artist Kathe Fraga to our�BED (Budget Editions)�line of open edition digital prints. 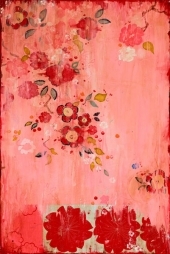 The newly released�images from Kathe Fraga’s French Wallpaper Series are inspired by�hand-painted motifs found on the timeworn walls of grand old Parisian mansions.��Fraga also draws inspiration from patterns found on vintage kimonos, hand-blocked wall panels and hand-worked embroidery.��Each painting resembles an aged decorative panel adorned with�birds, flowers, vines and leaves in the Chinoiserie style. Using layers of time, age and color, the artist’s modern interpretation of this style yields magical, dreamy, softly faded, and colorful narratives.